The demand on the American military uniform is growing in Uzbekistan. At the same time, it is still unclear how it gets to the domestic market. Many residents of Tashkent prefer American boots, pants, shirts and jackets to Uzbek and Chinese apparel despite the fact that American uniform is de facto the Second Hand the used apparel, underpriced or not sold on time in the shops – editorial note).. However, people are happy that they can buy high quality clothes and shoes at lower prices than those, offered by Uzbek producers. The American uniform can be offered at the Yangiabad market. There are few counters, selling American Military uniform; it looks like humanitarian aid items went directly to the entrepreneurs. The line includes military backpacks, caps, camouflage, winter and summer boots. The shoes are especially popular among the customers. The prices are not cheap. 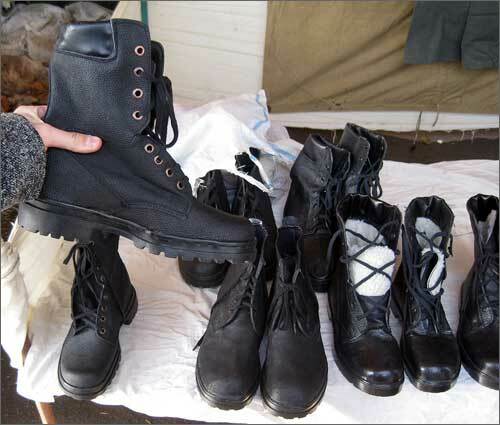 The least quality military boots cost about 80 000 sum ($40). The customers believe "it is better to pay more and use longer". For instance, "Uzbek shoes are cold and low quality while American shoes have reliable soles", one of the customers says. The sellers reluctantly tell us where they get the merchandise but they also affirm they have wide variety of any size: "We have them at the storehouse. Let us know when you are here next time and we will get you them". I asked where the storehouse was located. "Over there…This is humanitarian aid. Americans were selling cheap. People, who bought 100-200 pairs, are selling them now". Most of the uniform items were acquired during the existence of American airbase at Karshi-Khanabad. At the end of 2005 it was "expelled" in response to American critics of Uzbek President Islam Karimov for Andijan massacre. "Americans were leaving and selling everything. People bought uniform items very cheap and now they are selling them at high profit", the interviewee noted. 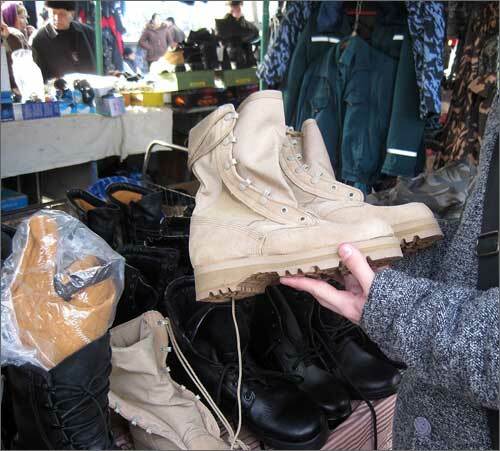 The points of sale had used tie sand-colored boots that ideally fit to the scenery of dry desert somewhere in Iraq or Afghanistan. They are thick with heavy sole. 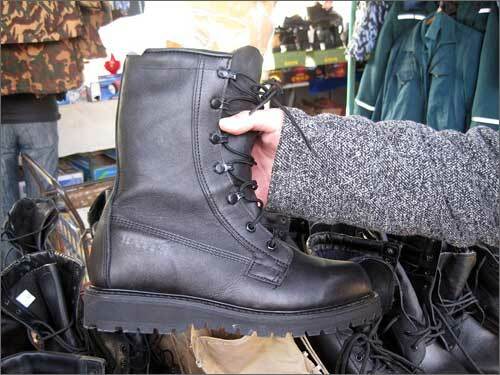 "The difference between real and faked boots is in joints. Sand-colored boots are designed for summer and autumn while black boots are designed for winter. They are reliable when you walk over the water, in the mountains. They are very comfortable and have convenient laces. They are warm and durable", another customer explained. The seller also mentioned that it is possible to buy brand new pair of shoes if the customer is ready to wait a little bit: "May be in a month or two weeks… I cannot say for sure". He also affirmed that in the next few weeks they are expecting new batch of American uniform. "During the transportation some uniform items may get deformed. We buy such items. They are brand new" the seller promised. Despite the fact that American military base has not existed in Khanabad since January 1 of 2006, the American military uniform is still supplied to Uzbekistan. Perhaps, it is being imported from Afghanistan. This was partially confirmed by another interviewee: "We used to get the merchandise from military base in Kashkadaria. Now buy bring it across Tajik border [from Afghanistan]" Therefore, second hand American uniform became the second export commodity of Afghanistan after drugs. 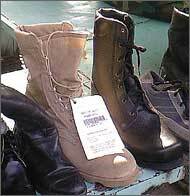 "Turning any item inside out, be it camouflage or army boots you will find special tags that distinguish them from faked Chinese counterparts. It is worthy thing to invest in", the salesperson affirms. In fact it is impossible to find same-quality items, produced in Uzbekistan, at the Tashkent markets. Chinese winter shoes costs 50 00 sum ($25) and more, but they get no customer satisfaction: "They go one month as if they were produced for one-time use only. You cannot blame the sellers. The price is moderate, but the quality is very poor". 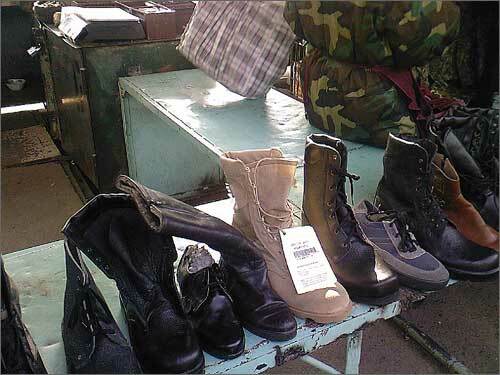 By the way, the Yangiabad market offers wide variety of Uzbek military uniform items from green police uniform to canvas-topped boots. The latter items costs only 16 000 sum ($8). On the other hand, there are fewer customers. "You are better off buying American second hand boots once in few years than acquiring Uzbek items every month", the customer concluded.